Most people incorrectly think Nintendo was created as a video game company, but the truth is, it was around well before Shigeru Miyamoto was even born. It was actually founded in the 19th century, and until recent decades specialized in selling Hanafuda playing cards. 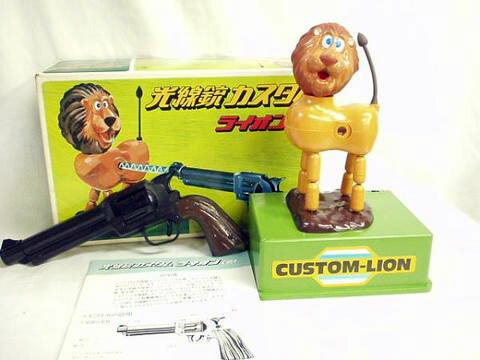 It wasn't until Hiroshi Yamauchi took the reins in the 1960's that it started expanding into other markets, and the first one of those markets it had success experimenting in was of children's toys. On this page rest many examples of them. And before someone sends me a letter complimenting me on my impressive collection of rare Japanese Nintendo toys, I'm going to freely admit none of these photos are mine. They're the same pictures that have been bouncing around from site to site in the last five years, originating from a now-offline photo gallery. 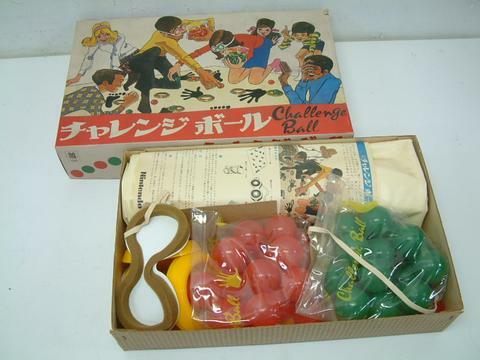 The only English words on this peculiar package say, "ROUND GAME." It certainly is round, but not much else is known about it. 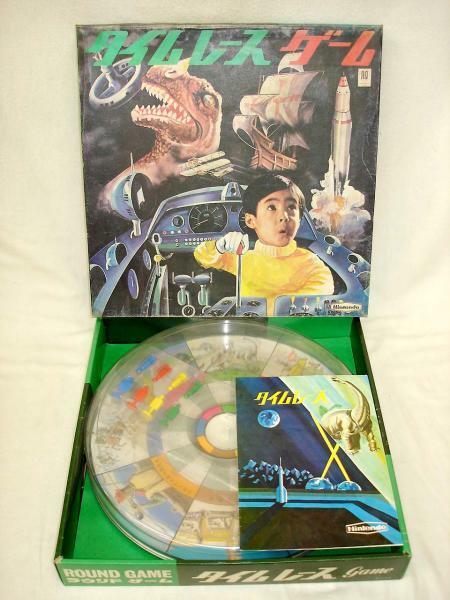 The box shows a space station, a dinosaur, an old-timey airplane, a Spanish galleon ship and a rocket, as well as a little kid in some kind of cockpit going "Ooooooh." The Round Game came with an instruction manual depicting an Apatosaurus being shot at by lasers on the Moon. If it proves anything, it's that Nintendo's ideas were weird long before Miyamoto hit the scene. ULTRA HAND: If you know a thing or two about Nintendo, then the name "Gunpei Yokoi" means something to you, as he was the inventor of the Game and Watch and later the Game Boy. But when he was first hired, it was to make toys, and his first creation was the Ultra Hand. Kids can manage fine with the hands they have, but if you offer them an improved model that extends three times the length of a plain ordinary arm, they'll go right for it. 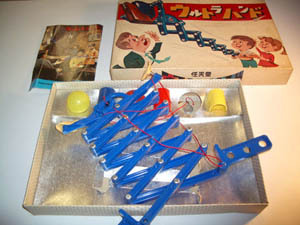 The Ultra Hand was a big hit for Nintendo, and Yokoi followed it up with the Ultra Machine, an automatic baseball pitcher. SURVEILLANCE SCOPE: Here's a Super Scope of a different variety. 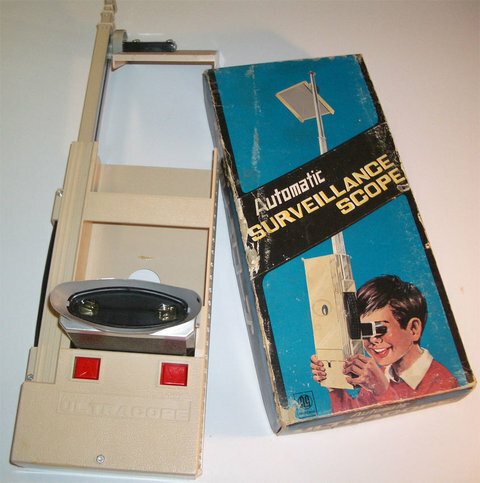 Actually it wasn't officially called the Surveillance Scope or the Super Scope, but the Ultra Scope. Yes, it's another "Ultra" product, courtesy of Gunpei Yokoi. Despite being under the same banner, none of the "Ultra" products had anything to do with each other, other than being totally Ultra. So....to play, two people put goggles on their faces and crawl all over a mat filled with hands, rubber rings, and the obvious red and green balls. Everyone else must crawl around them while laughing. One of them has to be holding a sealed package of bacon in his left hand. BREAKOUT CLONE MACHINE: One of Nintendo's first video game machines. 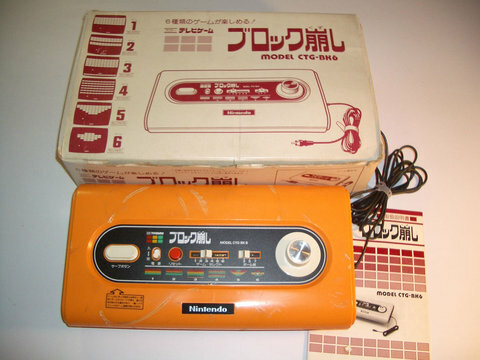 Before the Famicom, they spit out dedicated one-game consoles like everybody else in the 70's. All you can do with this one is play a knockoff of Breakout in six variations. Do you prefer the bricks arranged in rows or in a circle? It's up to YOU! 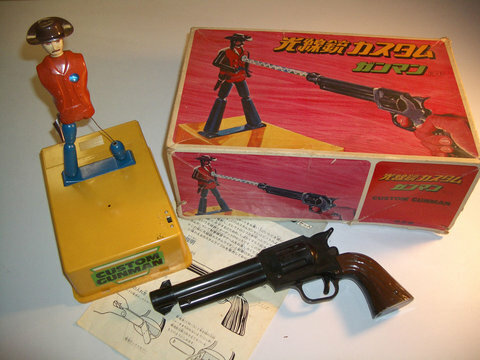 GUN AND GUY TO SHOOT AT WITH GUN: One of Nintendo's very first arcade games was Wild Gunman, released in 1976. A photo of a gruff Wild West gunslinger was projected onto a screen, and you were given a light gun and commanded to shoot him as soon as his eyes flashed. If you were quick enough, the picture would change to show him fallen on the ground, but if he won the duel instead, you saw a picture of him firing his gun and a piece of the Funeral March played to humiliate you. This was Nintendo's idea of a home version of Wild Gunman. It wasn't possible yet to bring it into your house electronically, so it had to be recreated in real life with plastic. Fire the included light gun at the figure and if you're quick enough, he'll lose a leg. If you aren't....I have no idea what he does to you. Ten years later, Nintendo made a video game version of Wild Gunman for both the arcades and the NES. 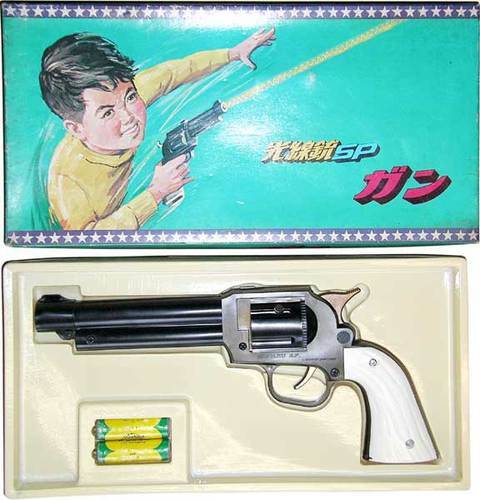 For the NES you were supposed to use the Zapper, but Japanese Famicom users got a fat package with a replica of a revolver inside, accurate enough to fool bank tellers. Aww...look at that lion. He loves getting shot. LIGHT GUN: Here's a closer look at a Nintendo light gun toy. The guns were also sold separately. No telltale orange cap or anything. What's most ironic is that Japan has much, much stricter gun control laws than America does. Most Japanese citizens cannot legally own a gun. They can, however, give their children exact gun replicas with no incident. 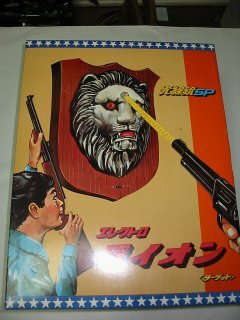 LOVE TESTER: From the makers of fake guns comes....fake love! The Love Tester, which claimed to measure the strength of passion between two people, really did nothing but measure electrical pulses in their palms. 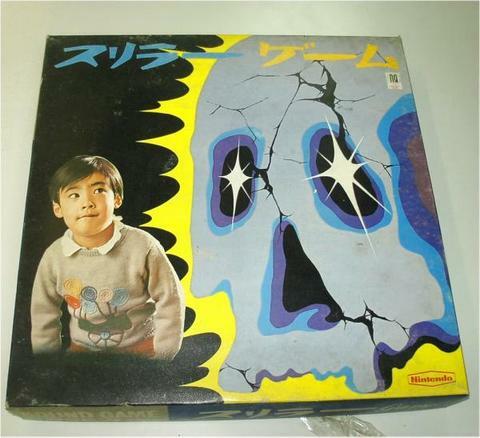 Japanese couples fell for it, though, and this was Nintendo's best-selling product of the 70's. 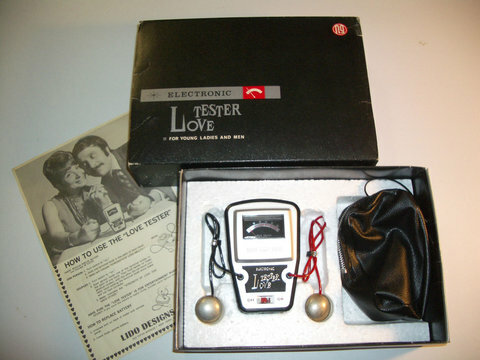 I wouldn't be surprised if the Love Tester makes a comeback in the form of a Wii attachment, because it's the type of thing their current casual audience would fall for as well. They could retitle it Wii Fit Emotionally or something. 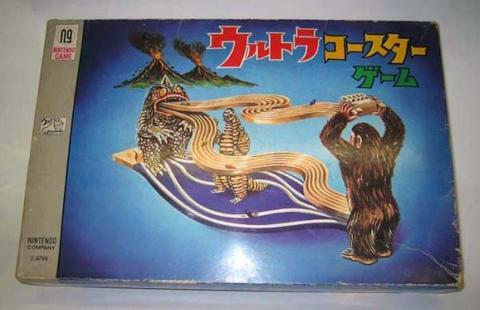 MOVIE MONSTERS DUEL WITH SPAGHETTI: Actually, it's a marble racing game. "King Kong" is holding what you insert the marbles into, and you tip his hand to start the race. In the top left corner is a Nintendo logo you don't see very often: in the spirit of "MB," here is "NG," standing for "Nintendo Game." MAN, I HAVE NO IDEA: A robot vacuum cleaner? A lamp? An Ultra Curling Stone? A Hanafuda playing-card sorter? A Ronco-like kitchen utensil? A Yakuza face blender? UPDATE: Someone who can read Japanese informed me what the package for this device said. Guess what? I was right the first time -- it's a vacuum cleaner (but remote-controlled instead of robotic). 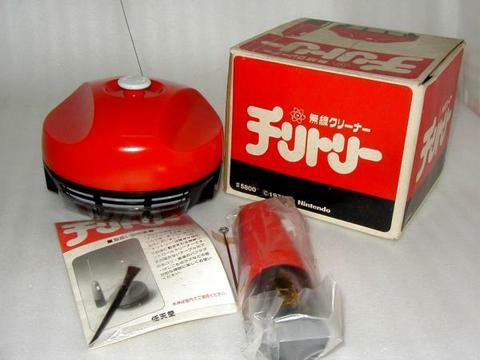 Nintendo sold vacuum cleaners at one point; who knew? YAKUMAN MACHINE: Along with the Game and Watch, here was another lesser-known piece of early LED entertainment. "Yakuman" isn't the name of some obscure Nintendo character; it's the name of the winning hand in the ubiquitous Japanese game of mahjongg. KID STARING CURIOUSLY AT SKULL: This is another "Round Game." BUY A "WILD GUNMAN" T-SHIRT. ONLY $45!